Rain delays for the big matches at SW19 will soon be but a distant memory from your childhood. Court 1 during this year's Championship. WIMBLEDON WILL HAVE a second retractable roof to keep the summer rain at bay for the 2019 Grand Slam event as the All England Club revealed it has secured a required £175 million loan. The venue’s second show court — Court One — will also see its capacity increased from 11,500 to 12,400 in the construction work. “In September 2016, the company extended the £175 million loan with HSBC to July 31, 2023 to finance the Number One Court project and aspect of the Master Plan,” the All England Club’s annual report says. The decision to have two courts with the ability to be covered puts Wimbledon ahead of the venues hosting the US and French Opens, but one behind Melbourne Park, which hosts the Australian Open in the middle of summer. Of the loan, £71 million (€78 million) will be spent on the roof and increased capacity. The loan will also be used to fund more clay and covered hard courts, alongside the grass ones, which forms part of Wimbledon’s ‘Master Plan’. 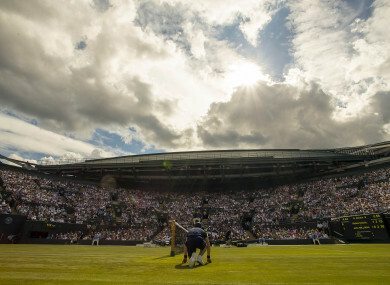 Wimbledon makes £125 million over five years from debenture seat sales and this profit will be used to pay off the loan, with extra income from TV rights, general ticket sales and sponsorship. The All England Club, which made a £33.2 million profit last year, paid off a £75 million loan in 2015 that funded the first part of the ‘Master Plan’, including the Centre Court roof. Email “Play on, player: Wimbledon will spend £71 million on a second roof”. Feedback on “Play on, player: Wimbledon will spend £71 million on a second roof”.